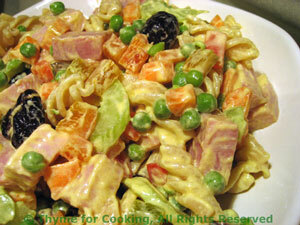 Creamy Pasta Salad, Ham, Peas, Peppers, Celery, Thyme for Cooking salads. I love creamy pasta salads - made with lots of mayonnaise. Unfortunately, my good sense tells me that it's not the most healthy way to enjoy summer. Using a bit of Greek or plain yogurt stretches the mayonnaise while still keeping the flavor. Put frozen peas in a strainer and run hot tap water over them until they are thawed, about 1 minute. Cut ham into bite-size pieces. Pit olives if needed, and cut in half. Mix all ingredients for salad (except dressing) in a large bowl. When the pasta is done, drain, rinse lightly in cool water. Add as much of the dressing as suits your taste; Stir and eat. Whisk all ingredients together. It will be quite thick.